Trinity Corner, ran from 102 Shiprow to 2 Putachieside. Regarding the house of the Holy Trinity at Aberdeen, Kennedy remarks : “King William in the latter end of his reign established a branch of the Order at Aberdeen, whither he sent in the year 1211, two Friars, who had been recommended to him by Pope Innocent; and granted and confirmed to them his Palace and Garden on the South side of the town, for their Convent.” Their church remained entire until the end of the 18th century, when it was demolished. 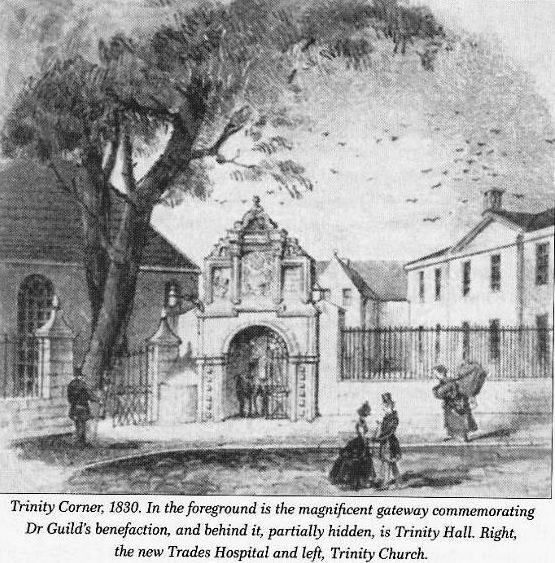 The Trinity Friars Place at Aberdeen gave name to Trinity Burn, now better known as the Denburn, and the Trinity Port at the south end of the Shiprow, one of the 6 Ancient Gates of the burgh which was removed some 200 years ago. King Robert Bruce, by a Charter dated in the I4th year of his reign, granted to the community of Aberdeen the privilege of holding their Trinity Fair within the Burgh. The Old Trades Hall in the Shiprow, Aberdeen. c.1850 This area, at the southern end of the Shiprow, was the site of the Monastery of the Trinity Friars until 1559 when it was burnt to the ground by Protestant Reformers. In 1631, having purchased the lands, Dr William Guild, gifted their old Chapel and other buildings to be a hospital and meeting house for the Seven Aberdeen Incorporated Trades. These were Hammermen, Bakers, Wrights and Coopers, Tailors, Shoemakers, Weavers, and later the Fleshers. Dr Guild was one of Aberdeen’s ministers and afterwards became Principal of Kings College. The Chapel became an Episcopal Church until 1794 when it was removed and replaced by the building seen at the left of the photograph. It was vacated in 1843, when the Congregation joined the Free Church, and was then sold and eventually became the Alhambra Music Hall until 1902. On the right was the Trades or Trinity Hall – often known as the Tarnty Ha. It had a projecting wing tower and corbelled angle turret, and was demolished around 1857 for Railway development. The Trades had already moved into their new premises in Union Street in 1846. ” A great number of human bones were found when the digging for Guild Street commenced, which had probably been the site of the ancient burial grounds of the Trinity Friars. It had extended to the south end of the convent, and ran east from the side of the church for some space. The bones were generally in a very great state of decay, the skulls dropping to pieces when lifted. The remains of a coffin in one instance were found, which fell to dust on exposure.